The Old Rectory in Handsworth is a beautiful grade 2 listed Georgian former rectory in Sheffield the grounds are beautiful and the venue itself can hold a lot of people, there is often an opportunity for a bouncy castle in the grounds too! The reception room is so big you can comfortably fly around the floor for a ceilidh or even bring along your own band! 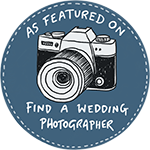 Lake District based wedding photographers Paul & Helen love to photograph weddings in Sheffield too with the Peak District close by. We even photograph weddings in Yorkshire the the North of England too!